This is Neil Swailes who specialises in house plants, surrounded by some prime specimens of the tropical orchids upon which he bases his reputation. “Go and look at the web and you’ll be back to buy the best!” is one of Neil’s cries.“We pride ourselves on selling top quality stuff,” he assured me, proudly holding up an exotic bloom with a confident grin. A relative newcomer in this long established market,“I’ve been here for just eight years,” he declared modestly, “although my family’s been here for twenty.” Neil married into the trade, his wife’s family own the business -“I married their daughter and then started working on the stall,” explained Neil with the open-hearted alacrity of one who takes life as it comes. 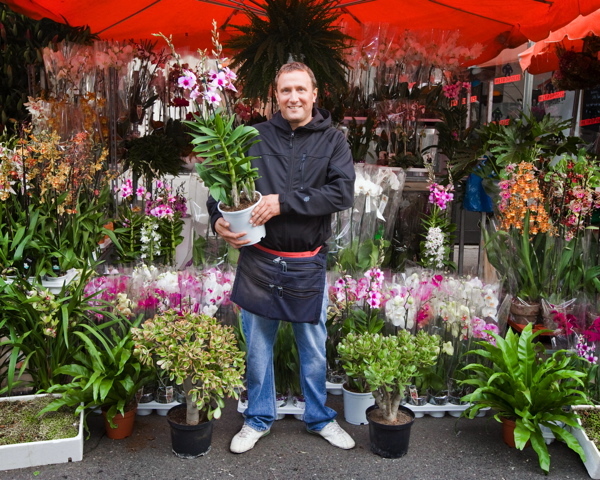 Based in Theydon Bois, Essex, Neil’s business consists in the import and selling of indoor plants, and he works as a gardener for the rest of the week. Each Sunday, Neil gets up at 1:30 in the morning to drive up to Columbia Rd and work a sixteen hour day. In common with many of his fellow traders he is devoted to this weekly ritual. “It’s a good business and nice people. I don’t know what I’d do without it now, I’d be lost,” he confided to me, even tolerating the mysterious meteorological phenomenon whereby, “It always usually rains on Sundays.” Just like the sale of garden plants, the trade in indoor plants also seasonal, “In the Summer it trails off but it picks up in the Winter, and Christmas is a good time.” said Neil with a grin of anticipation, as the season shifts in his favour. I’ll give you a call also.